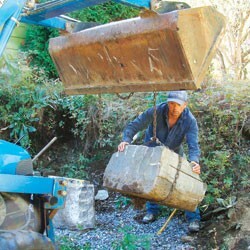 Hector Santos of Brownsville started working as a stonemason when he was 18. Twelve years ago, when he was 25, he launched his own Woodstock-area business, Hector Santos Inc. So he’s been around long enough to see how some of the dry-laid stone walls and outdoor sculptures he built a decade ago have fared with time. Judging by the pictures Santos took for his self-published book about his work, The Modern Stone Age, they haven’t budged. One sculpture photographed for the book consists of three canted granite slabs sticking out of the grass. Between them are sandwiched dozens of smaller, slightly curved pieces of mica schist arranged in wavy layers. The piece, called “Earth’s Crust,” looks like an upended section of tectonic plate, and it’s held together solely by gravity. A photo of the sculpture on the facing page, taken 11 years later, shows not a stone out of place. While not quite the 5000-year-old dolmens Santos once explored in Ireland, “Earth’s Crust” — funded by a Vermont Arts Council grant and installed on Prosper Road a few miles west of Woodstock — is built to last, as is all his work. That timelessness is one of the qualities that attracted Santos to stonemasonry. “Just knowing [that what you build] is going to be around for many, many, many years,” he says, helped hook him on the craft as a teenager, when he was living on a commune in Turners Falls, Mass., with his mother. (His father was from Puerto Rico.) Santos’ first apprenticeship, with the commune’s hippie construction worker, soon led to jobs all over Cape Cod. In 1989 Santos moved with his first wife to Vermont, where he tried organic farming for two years before apprenticing again with area stonemasons. He declines to name any of them, saying only that “you can’t throw a stone around here without hitting one, and they all do really good work.” But he does admit to reading southern Vermont master stone mason Dan Snow’s poetic books on the art, such as In the Company of Stone. Santos’ book consists primarily of photographs — of his hand-hewn circular steps, retaining walls, outdoor fireplaces, sculpture, one intricately stone-veneered house and several examples of framed wall art, which incorporate copper wire, sticks and paint. Some spreads show the building process in stages, revealing how much work is involved. Constructing a wall that can withstand seasonal freezing and thawing, for example, requires excavating a trench, laying PVC pipes for drainage and filling this “footing” with ledge stone, a kind of pebble that must be pressed down with a compactor before wall stone can be laid. “Water is the leading cause of death to stone walls in the United States,” explains a passage in the book’s quirky commentary. In addition to Santos’ 10-years-after photos, the book includes before-and-after pictures showing dilapidated and overgrown residential areas transformed into places of beauty — images guaranteed to make the aesthetically minded homeowner salivate. Santos later returned to rebuild from scratch a much older wall lining Kannenstine’s road; a photograph in the book documents that wall’s flawlessly straight line. He also designed and built a labyrinth in the yard that used as a centerpiece a large millstone Kannenstine had found half buried there, and incorporated stones she’d collected in her travels. It’s hard for a layperson examining the photographs in The Modern Stone Age to tell how good Santos’ work really is. French-born stonemason Baptiste LeFrançois, who launched his own Bolton Valley business seven years ago, is a stronger authority. “Yes, it’s good,” he concedes in his Norman accent after studying the pictures in Santos’ book. So, what constitutes bad stonework? When a wall has moved with time, LeFrançois replies simply, indicating that care wasn’t taken to allow for drainage. Talking of his own work — such as a bluestone patio with retaining wall he just finished for a Burlington customer — LeFrançois illuminates other aspects of good stonework: the perfection of a wall’s curve, obtained by chiseling each stone’s edge after it’s placed; the mere millimeters of space between a patio’s irregularly shaped slabs, which fit together like pieces of a puzzle; the subtle distribution of smaller pieces among the larger ones. Santos recently expanded his creative range by opening Renaissance Graphic Design, where he creates websites, posters, business cards, brochures and, of course, his book. The sideline is a way of supporting his family through the long winters, when stone building is impossible. “I wouldn’t recommend this line of work to many people,” he states bluntly. "The Modern Stone Age: The Stone Work of Hector Santos" by Hector Santos, Renaissance Publishing, 82 pages. $34.99. Available at Phoenix Books in Essex Junction, the Yankee Bookshop in Woodstock and Amazon.com.